Everyone could see it coming except me. Flap was bigger than all the other chickens because she was a week older. 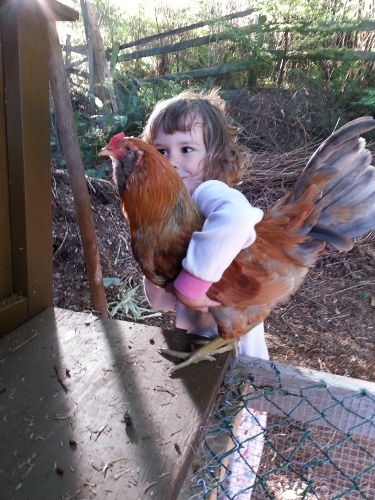 She had a redder comb because she was the dominant hen. She just happened to be very pretty, and more colourful, more outgoing and more than a little bossy. Now I can’t believe I ever thought otherwise. The fact that Flap is a rooster is as plain as the sun in the sky. He crows in the morning and whenever he hears us hanging out in the yard. He’s getting increasingly difficult to catch, although he’s still friendly to us when we do catch him. He leads all the other hens in exploring the yard whenever they are out of their enclosure, although he doesn’t seem to have any sense or ability to protect the flock. The other neighbour’s giant dog came up to sniff and bark at him from the fence, and Flap just stood there, looking for all the world like he was wishing the fence would disappear so he could take on that dog. None of the neighbours mind us having a rooster in the backyard, so Flap will stay with us for the time being. Maybe next spring we’ll get lucky with a broody hen, and maybe that hen will hatch some chicks who will grow up and lay blue eggs late next summer. Or maybe I’ll have chicken soup sometime this winter. I guess we’ll see. Yes – sometimes the ladies are really in charge. Well maybe more than sometimes. :-)) We’re just introducing a rooster to our hens. He’s amazing, truly. I just adore him!! He’s a blue orpington, and was leading all his fellow roosters around, watching the sky, showing them where the food was, keeping them from squabbling, etc. But today we put him with the hens and the hens are beating him up! Poor Moonlight. But still he went and got in bed with them, tonight, which was quite impressive, really. I hope the cranky hens will come around soon, because I think they have one hell of a good man!! So funny! I could have written this post. Just found out our sweet belle (who has never really been that sweet, just radiantly beautiful) isn’t a belle at all. Now our Snow White has a Prince Charming! He looks very similar to the coloring of your dude. 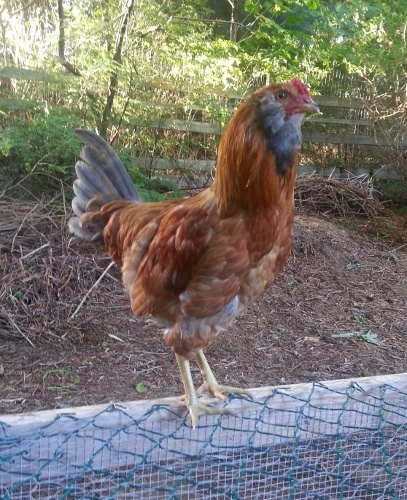 Found your blog on a google image search for EE Roosters to see what our prince will look like. How old is he in the picture?